The hotel City Avenue features a bistro, lobby bar and piano bar. 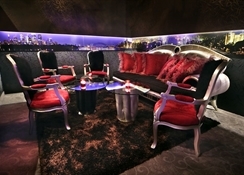 The 30 seat Lobby bar is situated in the spacious hotel lobby. There the guests would enjoy a variety of alcoholic beverages and soft drinks, coffee, cocktails and pastry. Piano Bar City Lights is exquisitely furnished and equipped with professional sound and lights accessories. This is the place where the visitors can listen to evergreens and dance, have a romantic rendezvous, or meet with friends, associates, partners… The City Lights Bar can seat sixty five persons in an elegant and stylish atmosphere – the perfect place for private parties, special events or just a relaxing night. Hotel City Avenue provides a tailor made decision for ?very event. The conference room can seat 80 persons, theater style. It is multi-functional, with daylight, equipped with multimedia, screen and flipchart. It is comfortable for business meetings, seminars, corporate events, presentations and trainings. The courtyard in front of the conference room provides options for open air activities. 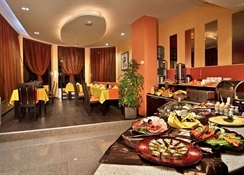 Hotel services: High speed Internet connection in all rooms, Wireless Internet in all rooms and public areas, Parking area, 24 h Reception, Lobby Bar with 35 seats, Conference Room, Laundry and dry cleaning service, Room for disabled guests, Wake up calls, Doctor on call, Luggage storage. 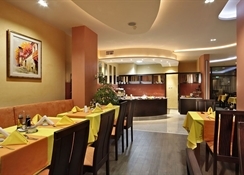 Hotel City Avenue is conveniently located in Sofia's central part, within walking distance to commercial district and government offices, cultural and architectural landmarks, restaurants and night clubs. Sofia International Airport lies 11 km from the hotel and the Central Railway Station – within 1 km. Today Sofia is a modern and busy capital with many theatres, concert halls, opera house, museums and galleries. The modern boulevards, cozy cafes and restaurants, picturesque markets, numerous parks and gardens complete the image of the city. 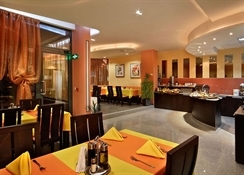 The hotel offers 35 comfortable and well-equipped, air-conditioned guestrooms. The rooms and suites have a modern design, decorated in elegant beige – brown colors and feature: mini-bar, cable TV, LCD TV, telephone, in-room safe, bathrobe & slippers, hairdryer and bathroom amenities, anti-fire system, opening windows. Non smoking rooms are available. Housekeeping services are also available. By plane: After leaving the Sofia Airport, drive directly to Tzarigradsko Shausse, then follow the signs to city center. Drive to Nezavisimost square and continue on Todor Aleksandrov Blvd. After 1.2 km turn right on Osogovo Str. The hotel is on your right hand side. By car: From Sofia head east onto Nezavisimost Sq. and drive at around 130 m. After then turn left and keep the square. Then continue on Todor Aleksandrov Blvd. After 1.2 km turn right on Osogovo Str. The hotel is on your right hand side. Note: The closest metro station SERDIKA connects the downtown with Lylin District in Sofia. Taxi: Taxis are reasonably priced but make sure the driver switches the meter on. Cleaning 3 times per week. Distance to the station 1 km to the railway station. Distance to the beach 410 km. Distance to the airport 11 km. Distance to town centre 1 km.